STRUCTURE. Erythromycin, a macrolide, consists of a lactone ring with unusual sugar side-chains. MECHANISM OF ACTION. Erythromycin inhibits protein synthesis by interrupting ribosomal function. INDICATIONS FOR USE. Erythromycin has a similar antibacterial spectrum to penicillin and is useful in individuals with penicillin allergy. It can be given orally or parenterally. 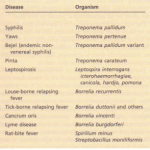 It is included in the treatment regimen of all pneumonias as many are due to Mycoplasma. It is effective in the treatment of infections due to Bordetella pertussis (whooping cough), Legionella, Campylobacter, Chlamydia, Coxiella and Listeria. 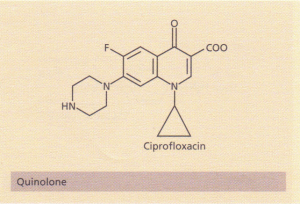 The newer macrolides (erythromycin derivatives), azithromycin, clarithromycin and roxithromycin, have a broader spectrum of activity that includes Gram-negative organisms, mycobacteria and Toxoplasma gondii, and superior pharmacokinetic properties with enhanced tissue and intracellular penetration and longer half-life that allows once or twice daily dosage. TOXICITY. 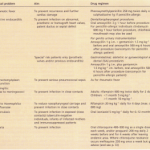 Erythromycin estolate may produce cholestatic jaundice after prolonged treatment. STRUCTURE. 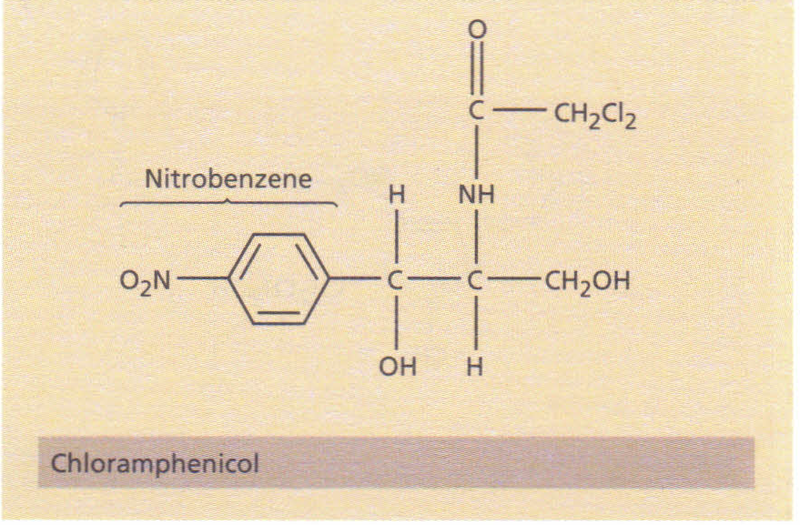 Chloramphenicol is the only naturally occurring antibiotic containing nitrobenzene (Fig. 1.11). This structure is probably important for its toxicity in humans and for its activity against bacteria. MECHANISM OF ACTION. Chloramphenicol is structurally similar to uridine-S-phosphate and competes with messenger RNA for ribosomal binding. It also inhibits peptidyl transferase. INDICATIONS FOR USE. Despite its toxicity, chloramphenicol is indicated for the treatment of severe infection due to Salmonella typhi and S. paratyphi (enteric fevers) and severe infections due to H. influenzae (meningitis and acute epiglottitis). It is also active against Yersinia pestis (plague) and is used topically for purulent conjunctivitis. RESISTANCE. Bacterial R factors code for acetylating enzymes that can inactivate chloramphenicol and also reduce bacterial cell permeability to this agent. INTERACTIONS. 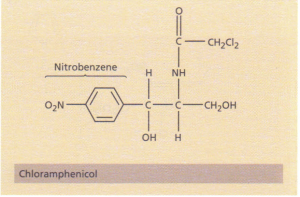 Chloramphenicol enhances the activity of anticoagulants, phenytoin and oral hypoglycaemic agents. drug; high blood levels lead to circulatory collapse and the often fatal ‘grey baby syndrome’. STRUCTURE. Fusidic acid has a structure resembling that of bile salts. MECHANISM OF ACTION. 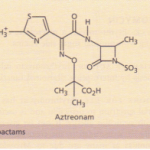 It is a potent inhibitor of bacterial protein synthesis. Its entry into cells is facilitated by the detergent properties inherent in its structure. INDICATIONS FOR USE. Fusidic acid is mainly used for penicillinase-producing Staph. aureus infections such as osteomyelitis or endocarditis, and for other staphylococcal infections associated with bacteraemia or septicaemia. The drug is well absorbed orally but is relatively expensive. It is well concentrated in bone. RESISTANCE may occur rapidly and is the reason why fusidic acid is given in combination with another antibiotic. TOXICITY. Fusidic acid may occasionally be hepatotoxic but is generally a safe drug and if necessary can be given during pregnancy. STRUCTURE. The sulphonamides are all derivatives of the prototype sulphanilamide. MECHANISM OF ACTION. Sulphonamides block thymidine and purine synthesis by inhibiting microbial folic acid synthesis. Trimethoprim also inhibits folic acid synthesis. due to the sulphonamide component. Sulpha pyridine in combination with 5-aminosalicylic. acid (i.e. sulphasalazine) is used in inflammatory bowel disease. 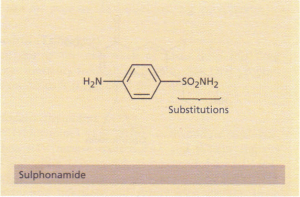 The structure of a sulphonamide. RESISTANCE. Bacteria may become resistant to sulphonamides by production of sulphonamide-resistant dihydropteroate synthetase and by altering bacterial cell permeability to these agents. INTERACTIONS. Sulphonamides potentiate oral nticoagulants and hypoglycaemic agents. TOXICITY. Sulphonamides cause thrombocytopenia, olate deficiency and megaloblastic anaemia and haemolysis in individuals with glucose-6-phosphate dehydrogenase deficiency, and therefore should not be used in such people. 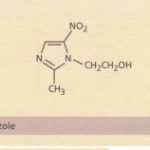 Co-trimoxazole should be avoided in the elderly if possible, as deaths have been recorded, probably due to the sulphonamide component. 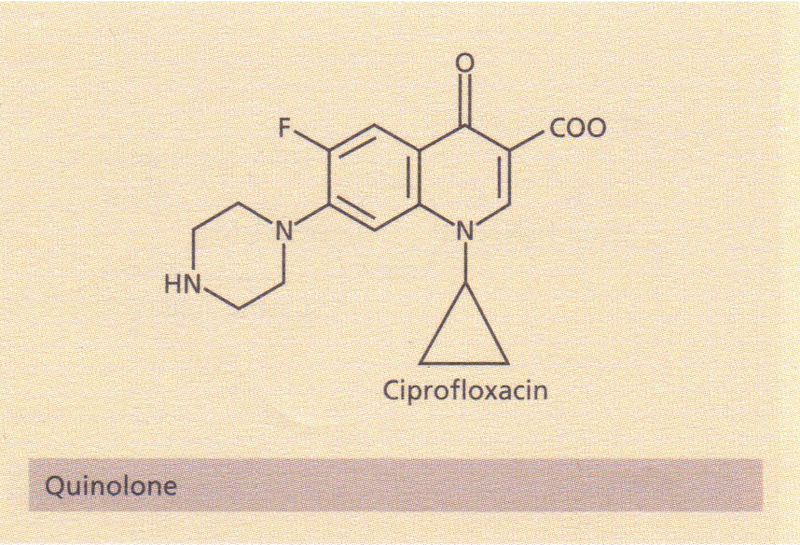 The new quinolone antibiotics, such as ciprofloxacin, norfloxacin and olfloxacin are useful oral broad-spectrum antibiotics, related structurally to nalidixic acid. The latter achieves only low serum concentrations after oral administration and its use has been limited to the urinary tract where it is concentrated. MECHANISM OF ACTION. 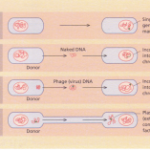 This group of bactericidal drugs inhibits bacterial DNA synthesis by inhibiting DNA gyrase, the enzyme responsible for maintaining the superhelical twists in DNA.